Dalston’s Bakery was built in 1906, and consists of a corner shop and residence above, with the large bakery to the rear, where evidence of the ovens remains inside. This proposal retains the building intact, but involves a 22 storey tower wrapping around and even leaning out over the heritage building in a very dominating manner. 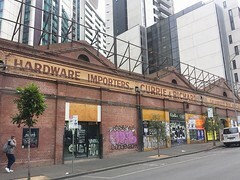 Melbourne Heritage Action believes that the proposal should be redesigned to be more sympathetic. We are concerned that this is yet another example of building into the air-space above a heritage building, something that should only be allowed if it doesnt dominate the building. If you have similar concerns, please send in an objection, which includes your name and address, to planning@melbourne.vic.gov.au. Evidence of the original ovens inside. 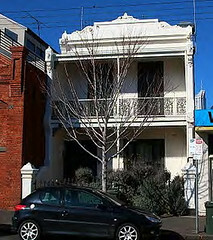 The Batman Street interface – a large pointed brick volume leaning out over the bakery and the chimneys. Absolutely Not! I am sending my objection. Another example of history being engulfed by Concrete Blocks. Look at the top end of Elizabeth Street and Flemington Roads.